Oil & Butter: Baby Soap, Whipped Gingerbread and Pumpkin Pie...it's been an eventful week! Baby Soap, Whipped Gingerbread and Pumpkin Pie...it's been an eventful week! I also had to deal with the unpleasant situation of someone using my photos without my permission on their website. I had made a few attempts to contact the person privately, to no avail. After reluctantly bringing it public, the picture was finally replaced, which I am grateful for. However, that now means that I will have to take the time to watermark each and every photo I post, which is time consuming, and frankly, it makes you question whether the information you are sharing is worth the risk. Please use basic internet etiquette...if you would like to use someone else’s picture, ask for permission. The majority of people won’t mind, and will be very thankful for your courtesy. Alternatively, at least give credit for the picture and a link back (I think most of us soap bloggers have done that at some point, and I think it’s perfectly reasonable). Otherwise, it’s a small internet world and if you are using someone else’s picture, you will get caught. Anyway, enough lecturing and back to soap! I hope you are all having a great weekend, thanks so much for reading! Beautiful soaps as always Cee! Love the little molds! I AM SO HAPPY that she finally took down your picture. It is sad to find out how many people can use your pic and hot give you any credit. I certainly try to do it everytime I refer a fellow soaper and if I forget - PLEASE SOMEONE REMIND ME! I am going to try the instructions above to see if I find any of my pics wondering around. Thanks Roxana, I know you give credit and links when you use others' photos, so no worries there! Hopefully you don't find any of your pics floating around either! Those bear molds are so cute! The other soaps are beautiful too..love the piping on the Pumpkin Pie! Thanks for the link on how to do an image search..and that really stinks that someone stole your photo! Thanks Kalla! I really tried to avoid bringing it public, but it seemed like that was the only way to get their attention, unfortunately. Such cute bear soaps, they are soo cute, I want to hug them and squeeze them and call them George (which only makes sense if you're a Looney Tunes fan). Your gingerbread men are adorable too and I love how you tied them all into a fall theme. It's really unfortunate that you had to out that woman for using your photos. I have in the past, used pictures I found on Google images on my blog posts, but certainly not as a selling point or to imply that I did the work shown in the images. Thanks for sharing the tutorials. Hopefully none of us will run into that unfortunate situation that you had, but it's good to know. Lol, I love that cartoon, I can totally picture it! It's tricky when it comes to copyrights and images on the internet. I'm sure I've probably committed some faux pas that I didn't realize I was committing, but I would surely respond to someone right away if they told me I was infringing. I had really tried to avoid bringing it public but now that it's over and done with, I've deleted my posts, and it's a clean slate as far as I'm concerned. These pitures were not used to sell product or said that they were made by website. so sorry Oil and Butter is upset about some one describing what a Goats Milk soap would look like. Stealing someones photos still makes me grrr! Sometimes I´m glad that my camera is old and does not take good pictures so I was hoping that nobody wants to use them. I still have to try to find if anybody is using also my pics. But back to your beautiful soaps. 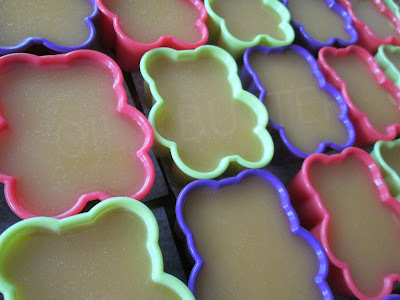 I love those cute little gingerbread men :) But what kind of FO did you use if it did not discolor the base of the soap? Now I would like to bake some gingerbreads (and my dog would also like it). Hi Marika, I used a pumpkin fragrance, and it did end up discoloring to a peanut butter color. I'm finding that the whipped soaps do not discolor to the same degree as regular CP soap, have you noticed that? Yes, I have noticed that whipped soap does not discolor as much than normal CP soap, but I have not used FO´s that discolor much. Sorry to hear about the photo theft! Gosh, it's no fun to have to worry about our photos getting stolen, and I have no clue how to watermark! Love all your soaps!!! The teddy bear is so adorable! Thank you so much Silvia! If you use PicMonkey (which I do and highly recommend) someone just showed me a brilliant link on how to create a watermark that you can import each time. That is much easier than what I was doing, which was creating a new watermark for each photo! I can imagine how frustrating it can be when you find out that somebody take something for you without your permission! Anyhow, I am glad that you solved it! Thanks for sharing your experience! Your recent soaps look so beautiful! Thanks Gordana, I'm glad it's over and done with too! All of those are very cute soaps, but that pumpkin pie is my favorite! You used buttermilk for teddy bear soaps - how does buttermilk smells when soaps are ready? Thanks Signe, I can't smell the buttermilk in the finished soap at all. It is a little strong when you first mix it with the lye, but it doesn't come through the finished soap. Love the pumpkin pie.....piping is so much fun! Just made my first batch of pumpkin soap ant it smells wonderful! Sorry about the theif of your picture, we take alot of time to make sure are pictures are just right and then to have someone steal them...urrrr! The teddy bear soaps are adorable (did't know you could use that type of mold) and I love the gingerbread whipped soap too! Those teddy bears soaps are so cute: so simple and delicate,and perfect for babies! I am sorry to hear about your stolen picture, but I am content to know that that person realized( I hope) that he/she made a mistake! Los jabones adorables, como siempre. Necesito muchas clases para poder ponerme a tu altura. Cuando voy a poder probarlos? Oh, eso es tan dulce Paulina ... gracias! Great news on your picture fiasco. I bet it feels good to have that over and done with so you can move on to more fun, creative things. You've been doing wonders with whipped soap - makes me want to try it one day! What a rich, luxurious topping on Pumpkin Pie! I could bite it! And those bears are so cute. I'm glad you sorted out the picture issue with that person. I know I have seen on some blog a window popping out with a note:'No,no, stealing is not nice.....' etc, whenever you would click on that image. I wonder how to do that!?? I know it's not efficient way to prevent stealing, as our photos can be found almost at every social media (FB, Pinterest,etc), but anyway, I would like to know how to do that. Google is not much of help at finding that info. Thanks for the info you have provided here! 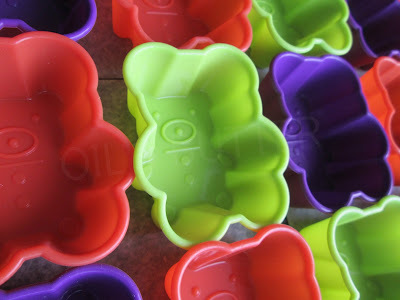 Those bear molds are so cute, Cee! I love how the baby soaps turned out. So sorry to hear that you had trouble with someone using your photos without permission. I'm glad that you eventually got it sorted out. Thanks for the tip about doing a Google Image Search. 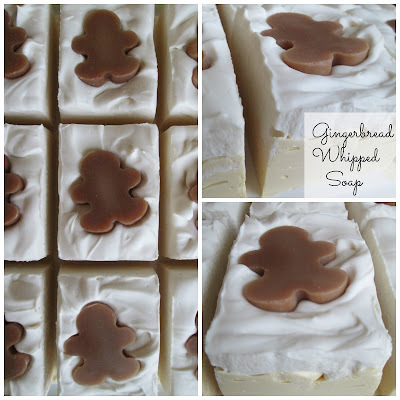 Oh, and the whipped gingerbread and pumpkin soaps are adorable, too! 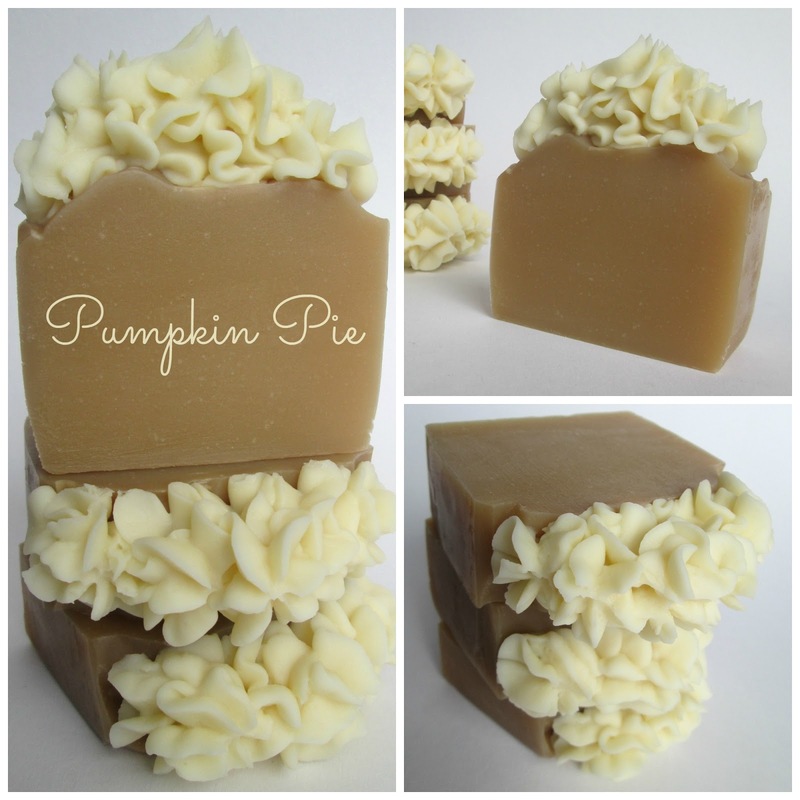 Love the pumpkin pie soaps - and they are just in time for the cooler weather when thoughts turn to hot drinks and yummy desserts! I haven't had anyone steal my photos, yet, but they probably have and I just don't know. I kind of don't want to. I watermark them and move on. Ignorance for me, on this issue, is the real bliss. I like to believe that the majority of people act right with a few bad apples thrown in to test our patience! WHERE did you find those little bear molds?? They are lovely. I love those teddy bears. Soooo cute! And the whipped soap with gingerbread men is adorable. FYI, you can try to disable right-clicking, but if you are up against someone who knows how to get around it, it's not going to prevent them from stealing the images. It just makes it a little more difficult. It might prevent the less-savvy thieves, however. Teddy Bears for babies - Baby Girl, Baby Teddy Bears, Our range of Teddy Bears and Soft toys for New Born and baby Girls.